June 8 is National Jelly-Filled Doughnut Day. One of America's favorite treats deserves its own holiday. Doughnuts a small fried rings of sweet and leavened dough. This treat originated in the Netherlands, where it was cooked first without a hole in the center. It's name was olykoek, that meant oily cake. Little pieces of sweet dough were deep fried in hot hog's fat. The first mention of doughnuts dates back to 1809, when Washington Irving wrote in History of New York about fried little balls of sweet dough. At that time word “doughnut” didn't exist, and it appeared only in 1900 after the publishing of story Peck's Bad Boy And His Pa by George W. Peck. 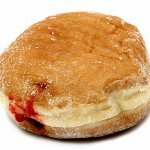 The hole in the center of doughnuts appeared in 1847, when a 16-year-old Hanson Gregory used a top of a round tin paper container to punch the holes in dough. This made the dough to cook evenly, and ring-shaped donuts soon became popular. Jelly-filled doughnut is without a hole in the center, otherwise it would be difficult to put filling inside. Jelly-filled doughnuts are not very simple to be cooked, because you have to place filling on the bottom half of the dough before you fry it in oil. So use your favorite jelly to make the best jelly-filled doughnuts to celebrate the holiday!